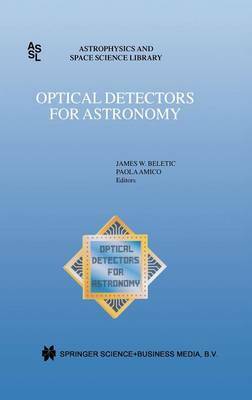 The Workshop "Optical Detectors for Astronomy" was held during October 8-10, 1996 at the headquarters of the European Southern Observatory in Garching, Germany. This was the third meeting of its kind, previous meetings being held in 1991 and 1993, but this is the first ESO "CCD Workshop" that has published proceedings. Most of the leading manufacturers and major astronomical observatories were represented, with the 117 attendees coming together from 14 different countries that spanned every continent on Earth. The motivation for the ESO CCD Workshop series is the creation of informal and open venue of information exchange about astronomical CCD detectors and systems. Judging from the reaction and feedback of the participants, the 1996 workshop was as successful as the previous editions, which is a credit to all who attended. The Workshop was organized as a mixture of invited talks, oral presentations, poster sessions and roundtable discussions, the latter used to foster a free exchange of ideas among participants. These technical sessions were complemented by an opening reception and a congenial evening in downtown Munich, which included a walking tour of the historic area followed by dinner at the famous Franziskaner brewery and an after dinner talk by Walter Kosonocky, who reviewed the history of CCD technology.